The academic regalia department of Saxon Uniforms presents Honor Stoles, Honor chords and Academic Tassels for your cap and gown sets. Cap and Gown sets each come with one tassel. However additional tassels may be ordred separately. Order solid or two tone graduation tassels (same price). For other academic items, such as caps and gowns, please visit our main graduation regalia page. We do not require your head size for mortarboards, as we use a one size fits all elastic cap that tends to fit most people much better than the old "sized" caps. 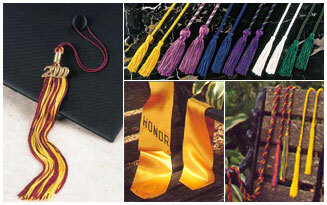 Price: individual mortarboards without tassels - $12.75 each. Individual tassels can be ordered for $6.50 each. 24 tassels or more, $4.75 each. Orders under $30, please add $5.00 small order fee. / $30.00 order or more, no small order fee. Standard (domestic - UPS ground) shipping is $6.50 for one cap, one tassel, or one cap and tassel set. If several caps and tassels are being ordered, then if order total is under $100.00, $8.50 s/h. If order is between $101.00-199.00 then $12.50 s/h. If order is $200.00 or more, then s/h is 6%.